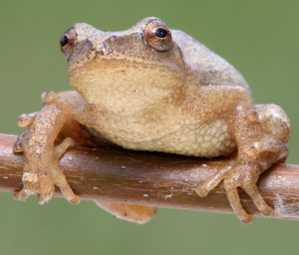 Fairfield, CT - The Connecticut Audubon Society Center at Fairfield, 2325 Burr Street, will host an Evening Peeper Prowl on Friday, April 12, from 7 - 9:00 p.m.
What’s teeny tiny, seldom seen, but often heard this time of year? It’s the Spring Peeper Frog!! Join us at the Connecticut Audubon Society’s Center at Fairfield, Friday April 12, at 7 p.m., when we’ll venture to the marsh and ponds of the Larsen Sanctuary on a quest to hear the familiar song of the spring peepers celebrating the arrival of spring. Our search will include other secretive animals like spotted salamanders and wood frogs. For ages 6 years and up. Boots, flashlights and warm attire are strongly suggested, no strollers please. Children must be with an adult. The program runs from 7 to 9 p.m., at The Connecticut Audubon Society’s Center at Fairfield, 2325 Burr Street, Fairfield. Cost: CAS Members $7/person, Non-members $10/person. Pre-registration required at: ctaudubon.org/2019/03/peeper-prowl-3/; or call 203-259-6305, ext. 109.